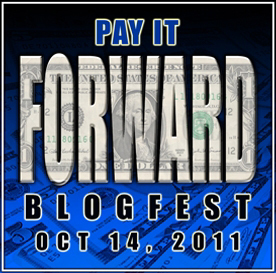 Alex J. Cavanaugh: Pay It Forward! Yes Alex, it must be tough for you, so I am off to check them out. I am already enjoying Leovi and he is not just a great artist but a great blogger too. I think we all had a tough time narrowing it down. I love all my followers. Love that picture, too. Priceless. Miranda, the one for Pirates was also funny. Elizabeth and Kitty, have a great weekend! Good luck with the blogfest Alex, I tried to put links on my blog but found it nigh impossible. Thanks for your kind comment on my Lonliness post. much appreciated. That sure is an awesome mash-up photo! Thanks so much for running this blog fest with me, Alex. Love this blogfest. I've stopped by your three and off to find more. :) Have a great day. Hi Alex, I was tempted to pick you as one of my three but you have no shortage of readers already! I'll go to these three you picked and give them some love. What a great surprise Alex, thank you very much for such beautiful words and for choosing between your three proposals. I'm really blush to go with these two extraordinary bloggers. Hope you Have a wonderful weekend! Thanks for organizing this Alex. It's going to be fun meeting everyone. Yvonee, sorry the links didn't work! Matthew, no problem! Today is going to be a blast. Civil War, that's fine - I am good to go I think! Leovi, you're welcome. You were the first to come to mind. Chewbacca is my favorite!! Love that. Thanks for hosting this blogfest. It's really great to meet others who love writing and storytelling. Looks like it's off to a great start. Stopped by to welcome Eve. That mash-up poster made me chuckle. Thanks! Great picks to visit and I'm off to call on Eve right now. Wonderful idea! Congrats to Matt and yourself for coming up with it. Gonna get moving on the follows in a bit. Have a great weekend. Not sure I'm following. Can't find your list now. Blogger might be at it again. I'll pop back in a while. I'm going over to visit your three...four. Have a great weekend. Great idea, and a wonderful way to celebrate other bloggers! Off to check some more out--thanks so much to you and Matt for rolling this out! Gail, thanks - she'll appreciate it. Jeremy, still time to join! Thanks guys and have fun this weekend exploring. That Ewok picture is just...disturbing. It kind of creeps me out. Wait. Strike that. It really creeps me out. 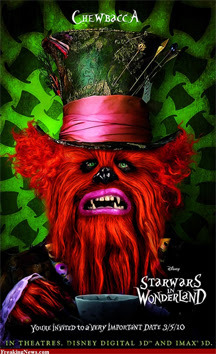 I love that picture of "Star Wars in Wonderland" - Chewbacca looks so cool! Thanks for the blogfest :). That is a pretty fantastic Star Wars mash up. Great choices on blogs to follow. Great pic for sure. I'm barely hanging on today but I will try to visit some new blog sites this weekend. This is downright crazy! We'll need a couple of weeks to get through all of these. But heck yeah, it's pretty great too. Thanks to you and Matthew for putting this together. It was definitely hard to narrow the selection to three. Thanks for co-hosting the blogfest. I'm off to check out your selections. BTW...love the mash up photo! Will have to show it to hubby later. He's a huge Star Wars fan. Alex! What a wonderful idea for a blogfest! I love it! Thanks for visiting me even when I have been here in this little box of my own world right now. I will be glad when I can get back to regular visits with everyone! Great picks . I'll try to visit as many as I can! This blogfest turned out massive! Love it! As usual, you have a great list of participants, Alex. If I had to narrow it down to three I don't know if I could. Kudos to you that were able to. Trust you to sneak a 4th in there! :o) Will check them out! I detect some shameless blog-host rule-breaking with that honourable mention :-) but I'll turn a blind eye because they all sound like awesome blogs and I'm off to check them out! "Hey, I said touch it, don't mash it!" That Chewy is so frightening. Thanks for doing this blogfest! Thanks for hosting this, looking forward to checking out all of the new blogs. This is an awesome blogfest! (You seem to have mad skillzzz at coming up with them!) Will definitely be participating. Can't wait to meet more awesome writers! It was so hard to pick 3. Awesome blogfest. I can't wait to meet some new bloggers! Just did my post, Alex. Another smashing blogfest! Thanks for this blogfest. I've discovered many new blogs and especially look forward to checking our Leovi's photo blog! MJ, sorry about the creepiness. Lee, that's why we held it on a Friday - everyone can take the weekend to explore. Susan, show him the site! There were some funny ones. Betty, I'd come see you no matter what. Cate, glad you're on board! George, it exceeded our expectations. Lydia, thanks for the laugh. Yes, thanks for hosting this with Matt, Alex. I'll check out those links. I do know Leovi already. An amazing artist. Sorry, I screwed this all up and combined this blog hop with another one. I'm just running out of time lately. Hi, Alex! This is such a great idea for a blogfest. I'm really enjoying finding all these new writers and bloggers. In response to your comment on my post today, I love the Shannara series! I'm so with you about the Warlock Lord. He's a fantastic villain. I haven't read those books in awhile so I think it's time to give 'em a re-read. Hot dog! Thanks for hosting this fantastic blog hop, Alex! Amazing how many people are participating! Have a great day. Great Blog-Hop! And great links - all new to me! Wahoo! LOL! Chewbacca never looked better. I'll go say hello to Eve. Your choices sound pretty interesting! That Photoshopped cover is hilarious. Great links. That picture sort of startled me. I scrolled down and gasped! I'm having a lot of fun with this blogfest and meeting lots of new people. Awesome stuff. Got Edi and Eve now. Thanks for the pointers to two blogs I hadn't run across yet. Wow, sure is a long list of blogs here. Hmm, guess I better start with those at the top and work my way down. See you in a few years. Great post today. I already follow Jeffrey and will check out the others. Great company for him to be in. greetings sir! well, i could have sworn i'd left comments on at least two previous posts but don't find them now - however blogger and FB both have been misbehaving for me of late so who knows - in any event, just dropping by to wish you a fab friday and a great weekend - seems my time these days is being confiscated by little ones and rope swings and trips for ice cream! ;) see you soon! The Blogfest button is all over my dashboard. Way to go, you two! you are absolutely incredible! Thank you so much for your kind words. I feel flattered. Yesterday (Thursday) I was so tired after work that I went to bed instead of checking my mails and the comment section of my blog. I'm sure you will welcome your 1000th follower within 2011. Tomorrow (Saturday) I will visit the 2011 Frankfurt Book Fair in Germany. Therefore I have to hurry up to finish my weekend post because I know I will be too tired after the fair to write a post. Alex, you ROCK, ROCK, ROCK, ROCK, ROCK, ROCK, ROCK, ROCK, ROCK !!!!!!!!!!!!!!! Pat, that's all right! It happens. Laura, his books got me hooked on reading and eventually writing. Draven, Jeffrey has mentioned you many times, but I couldn't find your blog until today. Hey Gypsywoman! I'll be visiting you soon, promise. Edi, thanks! Thousand followers is coming. Hope you get a ton of new followers today my friend. Hey again Alex! First, I can't express enough thanks to you and Matthew for hosting this wonderful bloghop. I woke up this morning with 16 new followers and they just keep on coming. WOW! How cool is that?! Second, you and Matthew have created a giant monster. How am I ever gonna find the time to visit everyone? I'm gonna try my best and I'm definitely gonna visit your recommendations. Thanks again for everything. You do ROCK!!! Thank you for hosting this blogfest! It's such a great idea. Whew, I've got my blogs to checkout this weekend list full! Nancy, thanks! Glad you are having a good time with it and making new friends. Laila, I'm still trying to visit everyone - it's going to take all weekend! Would be cool to hit a thousand before October 19. That's a special day for me. Thanks for co-hosting the blog fest! I met quite a few interesting bloggers, and I really appreciate the opportunity. And look at you--zeroing in on 1000 followers. That is fabulous--you definitely deserve it. You are a wonderful blogger. Missed the movie one, that would have been fun, but joined this one and have met bloggers by the ton! I've seen Leovi's site - very cool. I love the movie poster - so funny - I wonder if I can buy one. My daughter's still mad at me for hanging a Disney princess poster on her wall - this one would earn her forgiveness for sure. Thanks for hosting this! IT's a fantastic idea and always good to pay it forward!! Man, I went all day thinking I commented on this post. Can't believe I didn't. Generally, on Monday, Wednesday, and Friday, my alarm goes off, I lean over, pick it up (it's my phone), and when I shut it off I open up your blog, read what you have to say, then start my day. No wonder I had so many problems today - I didn't complete my routine by commenting. Anyway, this is pretty fun. Chewy makes a good, er, whatever he is there. That website is awesome, I think I might try my hand at some of the competitions they have there. And I'm off to see how many folks I can visit before I got to bed. Okay, so I didn't know of your blogs either! Great list. Thanks! Alex, I know that you have far too many blogs participating in your blogfest to visit all of us. As a new blogger, I just wanted to express my sincere gratitude to you for offering so many ways for us to get to know fellow bloggers. You Rock!. I noticed that you promoted Eve's blog and I think that is awesome. I listed her as one of my 3 as well. She is having a really tough time & I know that she appreciates your kindness & support. and thanks for always making time to visit everyone! I guess I know what I'm going to do this weekend when I'm not washing clothes, baking cookies, or writing papers. Yay! Congrats on the HUGE success of the Blogfest. I've found some really brilliant peole to follow already. A late start for the fest for me. These are some great blogs and I already love Jeffrey and Leovi so I know I'll love Edi and Eve. Great blog fest and great links! Thanks for hosting!! Thanks for hosting the blogfest, it's great fun! 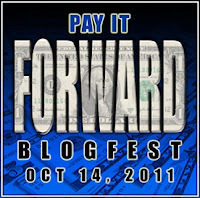 Congratulations Alex, I think the Pay it Forward blogfest! has been a success. Alex--Wow--what an awesome blog!! I'm from Ciara's blog--thanks for stopping by my blog. This blog rocks. Heidi, thanks! Just a dude trying to help his friends. Tonja, that is really funny. Rusty, MY blog starts your day? Dude, I need to start giving you some early-morning eye-openers then! And you should try one of their competitions. Melissa, my goal this weekend is to visit all of you, so I will get to yours soon! And Eve just needed a little boost of belief again. Melissa, really surprised you didn't already follow Edi's site. Leovi, it's been a huge success! Eve, you are welcome - bet you got quite a surprise. Last I looked there were about thirty comments for you. Still going through all the blogs I hope to get through them by tomorrow. Have a family thing going on this weekend. Great idea thanks for hosting this. Josh, it was all Matthew's idea! And yeah, it will take me all weekend to visit everyone. I thought I had a hard time picking three from my lineup. Thanks for running this funfest. Wow, thank you so much for stopping by my blog, and yours is amazing! I can't wait to read more, and I can't wait to visit your suggestions!! Terrific list of bloggers Alex... This was such a wonderful idea. Missed this as I did your book trailer. Seems like the Ninja Army is having a lot of fun hopping around. I do like what they have done to the image. Sorry I couldn't particpate, but I look forward to catching up with this wonderful list of bloggers! Wanton, maybe we'll do it again next year. Hey LisaAnn! Thanks, I appreciate that. YAY Alex and Matt! And love me some Chewy!!! I'm making a list of all the blogs people are listing for after I finish my current project. It's Sunday, so hope your weekend has been great! Great idea! I love your blogfests! Thanks, ladies! And Carol, good idea, otherwise this would be all you were doing this weekend. I love Leovi's abstract photos. They are wonderful. Thanks for the intro to his work. I have been so behind on my blogging that I missed this. What a great idea! Alex, just another way you show how helpful you are to other. Now, I have a lot of blogs to check out! Liza, sorry you missed it! Cold, you travel so much, I don't know how you keep up with anything. Kristen, I appreciate the follow! Alex, I wanted to be your 1000th follower, but I'll have to make do with 1002. Thanks to you and Matt for putting on such an awesome blogfest! Michael, thanks though - I appreciate it!